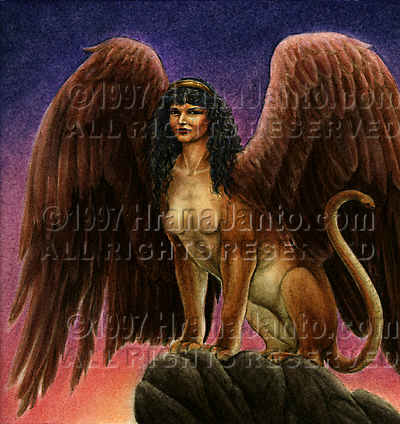 I painted Sphinx in 1996 for the Goddess Oracle. Sphinx, the "strangler" started her life in Egypt, where the lion-bodied monster had a bearded male head and represented royalty. But in Greece--in a city with the Egyptian name Thebes--the Sphinx became female. She was said to have been a Maenad who grew so wild in her intoxicated worship that she became monstrous: snake, lion, and woman combined. "What," the Sphinx would ask, "walked on four legs in the morning, two at noon, and three in the evening?" Finally one traveler, who would become King Oedipus of Thebes, answered her: Human beings, who crawl as children, walk upright as adults, and rely upon canes in age. Her reason for existence having been destroyed, the Sphinx destroyed herself.